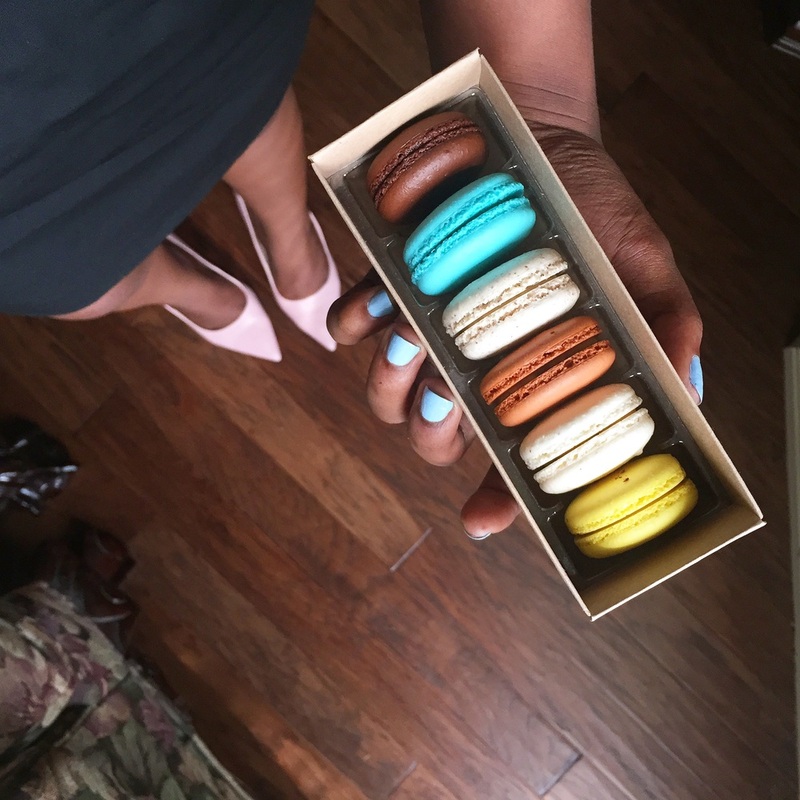 After a full day of my first jury duty experience, I decided to stop by Joy Macarons. I'm not really sure why it took me so long to visit because it's on my way home from Downtown Dallas, and I'm literally Downtown several times a week! I guess you could say that I lost my "macaron virginity" as it was my first time ever eating them. People have told me they love them, while others have mentioned not loving them. I didn't know what to expect and I tried them without any other bakery to compare them to -- all I had were reviews and opinions from others! Even though the packaging doesn't guarantee a great product, I love the cute little boxes/sleeves the macarons come in when you purchase a 6 or 12-pack! Macarons are simply a French meringue-based flavored cookie filled with ganache. I think the recent U.S. fascination with macarons came from Ladurée bakeries which are located mostly in European countries. I took a bite of the Chocolate Chip flavor first and I almost melted. It was filled with a cookie dough flavored ganache and I am a huge fan anything cookie dough flavored! Almond was a nice, light flavor, but the Butter Pecan blessed my soul. Salted Caramel any thing is delicious, but I really appreciated that the salty ganache wasn't too incredibly salty -- it was perfectly balanced. I'm not the greatest Dark Chocolate lover, but I would definitely buy an entire sleeve of dark chocolate macarons and stuff them while watching chick flicks. Lemon Fleur de Sel was good if you're a lemon lover. It was still super delicious, but not my absolute favorite out of the bunch. I was so mad at myself for eating them all practically at once! On my next trip, I want to try an entire sleeve of new flavors, but it's going to be really difficult to not add a few of my favorites from this one. Maybe half-and-half? Stay tuned!